We hope everyone has enjoyed the performances and talent that was displayed in both the First and Final Rounds of the 6th NWIPEC. We were astounded by all the applicants’ level of skill and maturity. If you were not present, then do not worry: photos and videos from the competition nights will be posted shortly. Please bear with us as the editing and uploading of the media is taking some time. Online ticket sales end one day prior to the Final Round. No refunds are available. Tickets are also sold at the door on the day of the Competition, for the same prices. The competition is now in full swing of final preparations and we are happy to report that this will be a super show! Excellent teams have joined to make our competition an amazing display of talent and skill. Anyone wishing to hear what duets and duos are capable of, should not miss this opportunity to witness some of the world’s best amateur teams. Needless to say, the competition executive is excited, and we know you, the audience, will be too. Please visit our Facebook page and see our posters for details. Tickets for the final round are now available on Eventbrite. To the competitors, we want to express our support for a great experience. 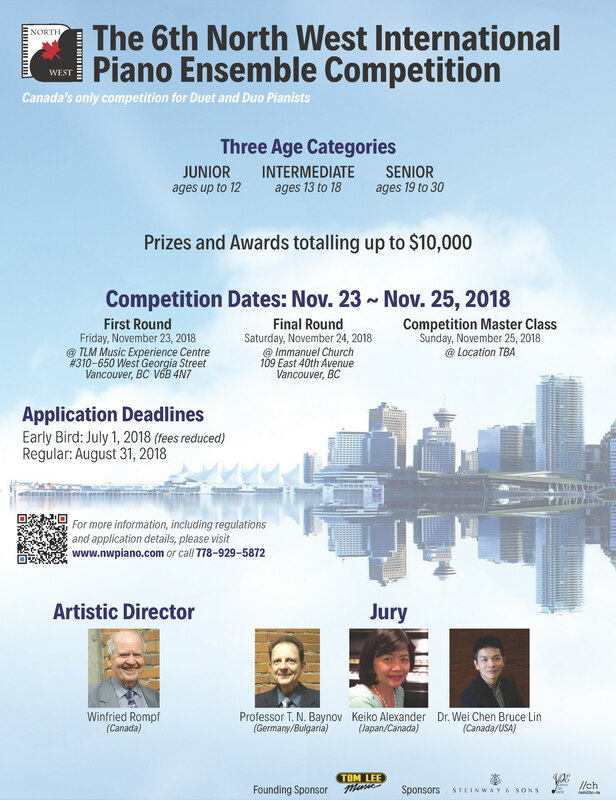 You are what makes the North West International Piano Ensemble Competition a recognized Canadian event. We, the NWPES, want to thank our sponsors—especially Tom Lee Music—for their great support. Without them, this kind of a competition would not be possible or as successful as it is. Early Bird Application Deadline Approaching! It is less than two weeks away until July 1st! This means that we are nearing the deadline for NWIPEC’s early bird application date—as well as, of course, the 151st anniversary of Canada’s birthday. So far, we have received interesting applications and inquiries from several countries and for the various categories of this competition. We are excited to have performers coming from Europe, Asia, and North America and we look forward to welcoming all of you to Canada. If you want to benefit from the early bird registration fee, please apply as early as possible or be in touch with us before July 1st, 2018. Details are in the Rules and Regulations page of this website. You are cordially invited to a piano duet and duo performance featuring Tanya Tyuleneva and Winfried Rompf. Student performers Isabelle Qiu and Kitty He will also be performing as well. The program will include works by Beethoven, Schubert, Busoni, Chasins, and more! A reception will follow after the music program. Register Now for the 2018 NWIPEC! 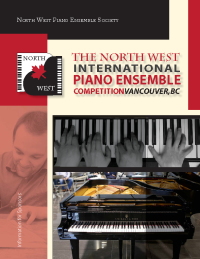 Following the wrap-up of the Information Session that was held on Monday, February 26th, we encourage everyone to register for the 2018 North West International Piano Ensemble Competition. Register now to qualify for the early bird registration fee! The 2018 NWIPEC Information Session held on Monday, February 26th wrapped to a close in the early afternoon at Tom Lee Music in downtown Vancouver. We have said this before, but we will say it again: thank you to Tom Lee Music for their generous support. Mr. Graham Blank, Vice President of TLM, spoke some wonderful words of encouragement. Among the attendance were Keiko Alexander and Dorothy Uytengsu, who had also given positive commentary. Musical entertainment was provided by two students of Rebecca Cheng who played Beethoven Sonata Op. 6, and then a spectacular performance by the Scott Meek Duo of the Tchaikovsky Waltz of the Flowers—a brand new and most electrifying arrangement. Bravo to the performers! If you were not able to make it, do not worry! Please feel free to browse through the Competition’s Rules & Regulations, or contact us with any inquiries that you may have. Parents, teachers, and all interested individuals are welcome and invited to attend our Information Session taking place in the morning on Monday, February 26, at Tom Lee Music’s facilities in downtown Vancouver. We are pleased to present to you the updated Information for Sponsors booklet. 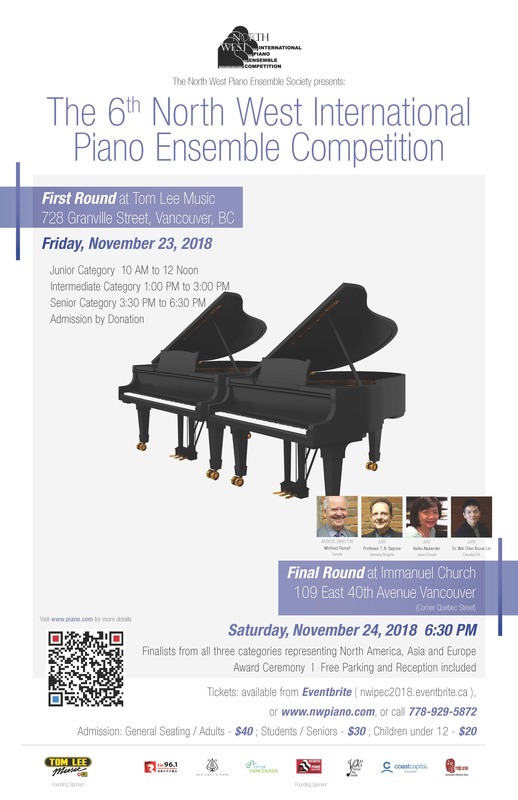 This 2018 version reflects the most up-to-date information reflecting the North West Piano Ensemble Society and the upcoming Competition in November. In the booklet, there is also a table listing of the sponsorship levels and benefits. 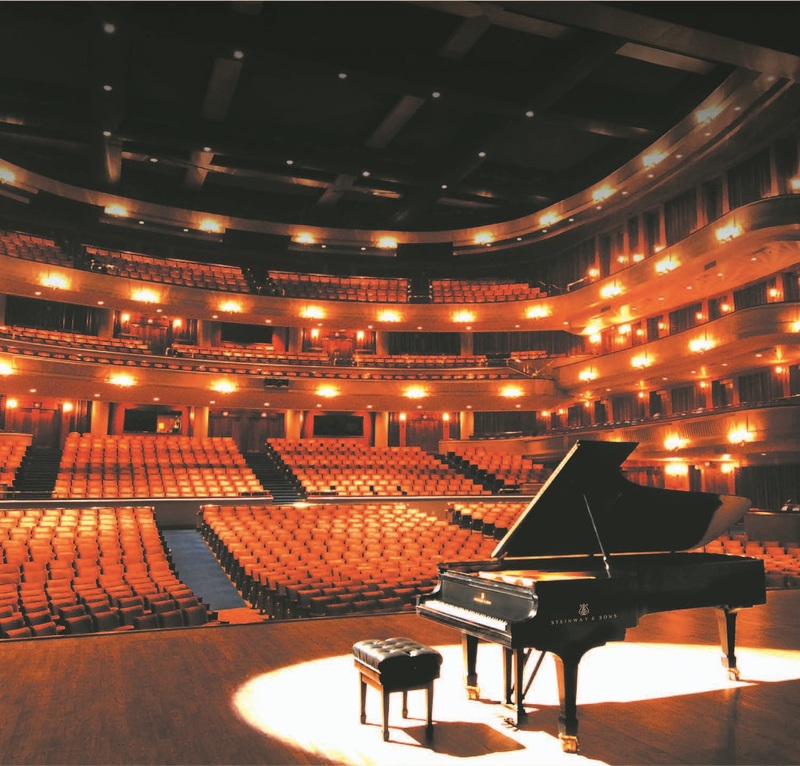 For more information, you may also see our Support Us page or contact us at info@nwpiano.com. The Fundraising Concert, featuring past competition winners and friends, has successfully concluded on Saturday, December 9th, 2017. The concert was held at the Immanuel Church from 7:00 PM to 9:00 PM. See our event page on Eventbrite. Performers that night showcased their talent on stage, which includes a number of pianists, vocalists, as well as a cellist. See below for a full list of performers. You may also contact us using our online form here.